The 11" Articulating Magic Arm from Mottus allows you to mount a variety of photo and video equipment such as lighting, field monitor, and sound recorder up to 15 lb. 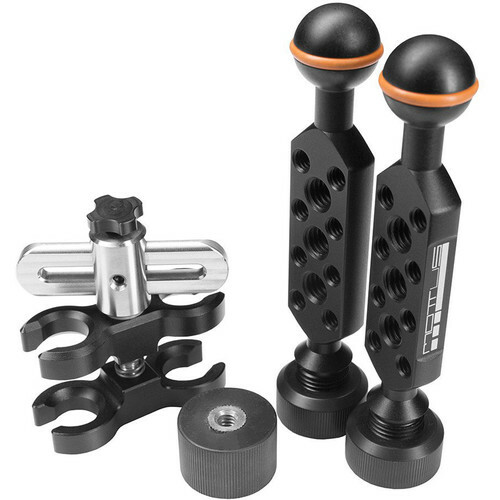 Made up of two 5" arms with adjustable spherical balls, a connecting clamp, and a reducing spacer, the Magic Arm allows for four-axis movement. Using the multiple 1/4"-20 and 3/8"-16 mounting points, you can mount the arm to sliders and camera cages. It is made from solid aluminum and steel to assure performance in any conditions, and has a rubber non-slip base.